These are our prices! Don’t forget that in Gran Paintball Madrid you will play the games between you and your friends and we will NEVER join you with other groups or unknown clients. In addition, if you are 12 or more, you can play for FREE with the offer chosen by the rest of the group, in both adult and children’s Paintball. You can see all the details in our section of Offers. 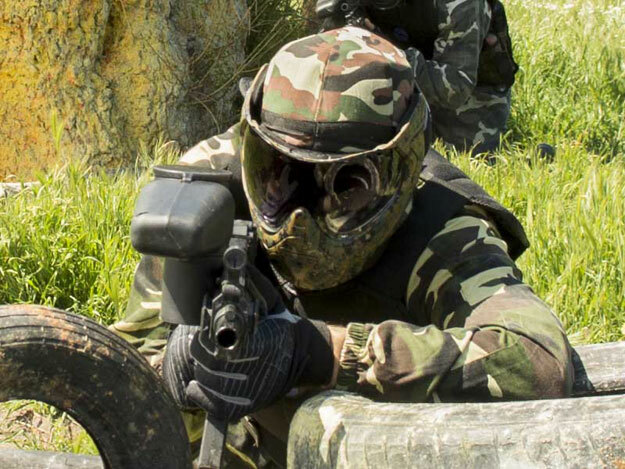 Unique material not offered by any other Paintball in Spain: Anti-fogging double lens mask – Camouflage military suit with neck protector – Camouflage protective vest – Gloves – Semi-automatic marker Bravo Tactical. – NEW! Professional camouflage belt with holster and integrated space for the air cylinder (which is connected to the marker by means of a cable!). Compressed air bottle (higher quality than CO2), unlimited air refills – 100 Ball Charger – Civil Liability Insurance and Accident Insurance. Automatic shooting: Shooting without pause (100 balls 10 seconds!). Don’t forget to visit our Offers section, where you will find the cheapest packages that best suit what you are looking for! Anti-fog mask of Premium – Camouflage Military Suit of different colors depending on the equipment to which you belong, with neck protector; children’s size – Protective vest (both boys and girls) – Gloves – Marker Valken Gotcha and JT Splatmaster with charger – 100 Balls – Civil Liability Insurance and Accident Insurance. Anti-fogging mask of Premium – Camouflage Military Overall with different colors according to the equipment to which you belong, with neck protector included and children’s size – Protective vests (both boys and girls) – Gloves – Marker Valken Gotcha cal50 with charger – Infinite balls for 60 minutes – Civil Liability Insurance and Accident Insurance. Anti-fog Premium Mask – Military Overall with neck protector (special size children) camouflage with different colors depending on the equipment to which you belong – Protective vests (both boys and girls) – Gloves – Marker Valken Gotcha cal50 with charger – Infinite balls for 90 minutes – Civil Liability Insurance and Accident Insurance.